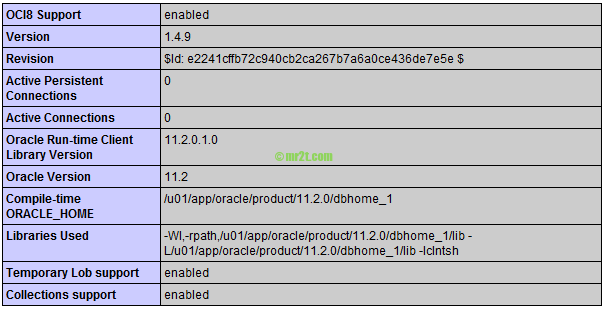 After fixed error in invoking target ‘mkldflags ntcontab.o nnfgt.o’ on Oracle Database 11g R2 64 bit. Later it is about the web/application servers, install apache and php5 standard modules and connect from PHP to oracle via OCI8 package. At first you must installed php-pear package before using pecl install oci8 command. There is no OCI8 entry in phpinfo() output, but php -i on command line found OCI8 module. The Loaded Configuration File of phpinfo() and php-i point at the same path : : /etc/php.ini . However, as I said, there is no OCI8 entry in phpinfo() output and found OCI8 module at php command line. Go down to Installation Task to see oracle environments of 2 sections above ! Before the installation I disabled SELinux by edit config file (basic change) and restart to take effect. php-pear is installed or not ? if not install used yum install php-pear or rpm -ivh command that you bold. or run above command to read new parameters. If everything went well, normally you will see the OCI8 entry if you run phpinfo() in a test PHP script on webpage. Hope this may help my online IT friends !